Midland College maintains an admissions policy which ensures that all persons who can profit from post-secondary education have an opportunity to enroll. Students begin the admission process by completing an application, available online at www.applytexas.org. Applicants may assume admission acceptance after all requirements are met. All inquiries should be addressed to the Enrollment Services Office, enroll@midland.edu. Please remember that being admitted to Midland College does NOT guarantee admission to certain specific programs of study. Specialized programs usually have additional qualification requirements. Applicants should consult with the division dean or a counselor/advisor for details concerning admission to these programs. Texas public institutions of higher education are required to assess all first-time college students under the Texas Success Initiative (TEC ʂ51.3062) using the new Texas Success Initiative (TSI) Assessment. Please visit the Midland College Testing Center website for more information. All students who are developmental in two or more areas must take a PREP course in their first semester. This course must be completed with a “C” or better. Texas State Law SB 1107 mandates that all entering students under the age of 22 provide a certificate signed by a health care provider or an official immunization record verifying that the student has been vaccinated against bacterial meningitis, or has received a booster during the five years prior to registration and at least 10 days before the first day of the semester. Entering students include those entering college for the first time, transfer students from other colleges and returning or continuing students who have had a break in enrollment of at least one fall or spring semester. Students who submit an affidavit or a certificate signed by a physician who is duly registered and licensed to practice medicine in the United States, in which it is stated that in the physician’s opinion, the vaccination required would be injurious to the health and well-being of the student. Students who submit an affidavit signed by the student stating that the student declines the vaccination for bacterial meningitis for reasons of conscience, including religious belief. Students living on campus must use the conscientious exemption form from the Texas Department of State Health Services. Allow several weeks to submit and have form approved by the Texas Department of State Health Services. Students are advised to check with their health insurance company regarding reimbursement policies for the vaccine. The bacterial meningitis vaccine is available at pharmacies. The local public health department has vaccines for uninsured and underinsured individuals. Please see the Midland College meningitis web page for more information. Midland College students enrolled in certain health-related occupations and for those who live in on-campus housing may be required to show proof of other immunizations against communicable diseases. Students should contact the division dean of the appropriate program or the Student Life Director (432) 685-4781. It is the responsibility of each student attending Midland College to register under the proper residence classification and pay the correct tuition and fees. The Texas Higher Education Coordinating Board rule 21.731 requires each student applying to enroll at an institution to respond to a set of core residency questions for the purpose of determining the student’s eligibility for classification as a resident. This questionnaire, along with other pertinent residency information, is available in the Enrollment Services Office and on the Midland College website at www.midland.edu/admissions. A Texas resident who physically resides within the geographic boundaries of the Midland College district, excluding student housing or residence halls. The Midland College Board has adopted Section 130.0032, Subchapter A, of the Texas Education Code that permits a person who resides outside of the Midland College District and who owns property subject to ad valorem taxation by the Midland College District, or a dependent of the person, to pay tuition at the rate applicable to a student who resides in the district. To qualify for this benefit, the property owner or dependent must provide the Enrollment Services Office with a copy of a Notice of Appraised Value Statement from the Midland Central Appraisal District in the property owner or dependent’s name that shows Midland College as one of the taxing units. Midland College has entered into agreements with certain school districts allowing high school students to earn both high school and college credit for selected courses. For more information, students should contact their high school or Midland College counselor/advisor. The Midland College web page has complete information on the Dual Credit registration process. It is highly suggested that students coming from non- English speaking countries take an ESL course their first semester at Midland College. International students must abide by Midland College rules as well as additional federal and state guidelines. Prospective international students must file completed applications with all required forms and a $20 non-refundable application fee. Send the fee, in the form of a check or money order payable to Midland College, to the Director of Counseling. An I-20 form will be issued to the student when the above qualifications have been met. International students must enroll and complete at least 12 semester hours of course work each semester. For further admission information go online www.midland.edu/international. Contact the Vice President of Student Services for information on the appeal process. A student may contract with an instructor to enroll in a credit course as an audit (non-credit) student. A student auditing a course will not receive a final grade or credit.. The student is required to pay full tuition and additional fees. Audit status is determined at the time of registration and no later than the census date of the semester of enrollment. Non-degree seeking students who are enrolled in another college or university who attend Midland College for one or more semesters, and are not eligible for grants, loans, or work-study. Transient students are required to provide official copies of all transcripts from every college or university previously attended. completed at an approved institution. Transfer courses from Texas institutions with a Common Course Number and drawn from the Academic Course Guide are accepted. Courses found in the Workforce Education Course Manual may also be accepted. Courses not included in the above methods are evaluated based on content and semester credit hours with consultation with and approval of instructional administration as needed. Transfer students are required to provide official copies of all transcripts from every college or university previously attended. As transcripts from accredited colleges and universities are received for degree-seeking students, they are evaluated in the Registration Office. A copy of that evaluation is sent to the student at the address recorded in the student files. Continued enrollment is contingent on receipt of all official transcripts. Please send transcript electronically, institution to institution via SPEEDE if service is available. Students who transfer to other colleges or universities before completing a Midland College degree, are encouraged to send official transcripts from attending institutions to the Midland College Registration Office to fulfill their Associate Degree requirements. A minimum of 15 credit hours must be earned from Midland College. Students interested in this option should consult with a counselor/advisor in Student Services. Students should select a major field of study and a college or university which offers a bachelor’s degree in that field. A Midland College counselor/advisor will help students select Midland College courses corresponding to those they would take at the college or university. Depending on the institution, students can expect a variety of benefits including: special admissions coordination to the universities, early degree planning, access to upper level advising, and access to the institutions’ online student website. 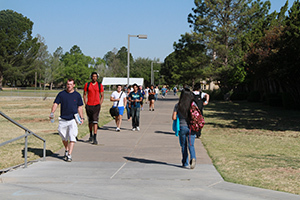 Transfer programs provide for the retroactive awarding of an associate degree from Midland College. This process allows hours completed at the upper-level institution to be transferred back to Midland College to complete an associate degree program. Visit with a counselor/advisor to identify interests, testing needs and degree plan. Midland College provides a professional staff to help students with academic, personal and career counseling/advising, financial aid, and international student advising. Academic advisement is provided regarding appropriate major and course selection, study habits, developmental work and transferring to other colleges or universities. Faculty advisors cooperate with the counseling/advising staff in aiding the individual student with academic issues of course selection and career choice. Degree plans should be arranged with the advisor as early as possible and may be modified at any time. Prior to the semester of graduation, students must have the degree plan approved by the appropriate division office. Veterans Services - Students eligible for federal VA education benefits should contact the coordinator in the Midland College Financial Aid office. Hazlewood Act benefits are processed through the Financial Aid office. Some veterans may also qualify for certain residency exemptions. More information on these benefits and links to additional veteran information are available on our website. The Career/Transfer Center provides services for students, including job placement, career interest tests, work-study information, transfer resources, and select grant support services. Additional services include career related workshops resume writing, job search skills, and annual job fair. Computers are available for students to research career, transfer and job inquiries. Student Support Services is a federal TRiO program funded by a grant from the Department of Education in the amount of $247,584. The amount awarded and number served by the program is subject to change by congressional action such as the recent sequestration. Designed to serve 160 participants, the goal of SSS is to keep students in college and increase graduation rates while assisting with the transition to the university of choice. In addition to providing one-on-one advising and registration, participants can get help with financial literacy, including how to find scholarships. SSS also has tutors and mentors that help encourage success at Midland College through test preparation, study skills, and overall academic development. Students with disabilities should notify Midland College in advance regarding their need for services to allow arrangements to be in place at the beginning of each semester. Students who require sign language interpreters or materials from Recording for the Blind & Dyslexic should contact the specialist as soon as possible because these accommodations may require additional time to implement. Midland College assistance may include but is not limited to note takers, scribes, and transcriptions of tape recordings, tape recorders, alternative testing options, preferential seating or other appropriate accommodations. An ACCESS Lab designed for students with disabilities is available in the advising area of the Scharbauer Student Center. A complete handbook for students with disabilities is available in the Scharbauer Student Center. Information, forms, and resources are available on the MC website. Midland College will grant a maximum of 24 semester credit hours (SCH) to any new student having an International Baccalaureate Diploma based on the table below. Midland College may grant fewer than 24 SCH to a student if the student has scored less than 4 on any IBD examination administered as part of the diploma program. Applicants with the IB diploma must provide a completed IB transcript to the Enrollment Services Office before enrolling in order to receive credit. The Testing Center, located in the Scharbauer Student Center offers a wide array of testing services for students. The Center provides make-up testing for Midland College faculty, proctors exams for distance learning and Virtual College of Texas (VCT) courses, as well as administering a number of professional certification tests. Midland College administers College Level Examination Program (CLEP) examinations. Upon approval of the Division Dean and departmental faculty, departmental examinations may be used in cases where approved CLEP tests are not available. Procedures also exist for the granting of credit through the Advanced Placement by examination. Credit by exam will not be granted until student has earned an equal or greater number or semester credit hours at Midland College. Please inquire in the Testing Center for additional information. Midland College may grant credit toward a degree or certificate if a student has achieved knowledge and skills from non-traditional sources. This knowledge must be demonstrated by: 1) written examination conducted by nationally recognized services or by a Midland College instructional department; 2) professional certification; or 3) military training/education. The maximum credit that will be awarded for non-traditional learning is 75% of the semester credit hours needed for the degree sought. Students should contact the Registration Office for detailed information. The GED® test is administered in Room 182 of the Technical Center Annex. In order to receive a Texas Certificate of High School Equivalency, a student must pass all tests. Advance registration is required. Please contact the GED® Examiner at (432) 685-4718 for detailed information on fees and scheduling a test. Information can also be found on the Adult and Developmental Education page on the Midland College website. A student who transfers to Midland College from other accredited institutions of higher education with appropriate college-level work in the areas of writing, reading and/or mathematics (grades of “C” or higher) may be deemed as college-ready after review by the Registration Office. Students not meeting college-readiness in writing, reading or mathematics will be required to take the TSI Assessment for that area. A student not exempt from TSI or developmental education must follow this plan of action. Students are encouraged to meet with a counselor/advisor if he/she is in need of assistance in planning a course schedule. Consult the online course schedule for more details. *Student liability insurance is required for students enrolled in Alcohol and Drug Abuse Counseling 2166 and 2167; Associate Degree Nursing clinical courses; Child Care and Development courses; Cosmetology courses; Diagnostic Medical Sonography clinical courses; Emergency Medical Services clinical courses; Health Information Management clinical courses; Respiratory Care clinical courses; and Vocational Nursing clinical courses. This is subject to change due to insurance rate changes.